Discussion in 'Magazines' started by Dosmujeres, Feb 16, 2009.
i don't like either covers. thanks for posting. I don't like the cover, it's not ugly but somethings bothers me there. Missy looks like she's (a) possessed by a demon, and (b) trying out for a part in Aladdin. But there's bound to be something nice in the contents, it's a March issue. I have mixed feelings over the cover aswell, she dosent look good with that face expression yet it still draws me in, but even the styling is bad. Intense stare but it doesn't make for a good cover. 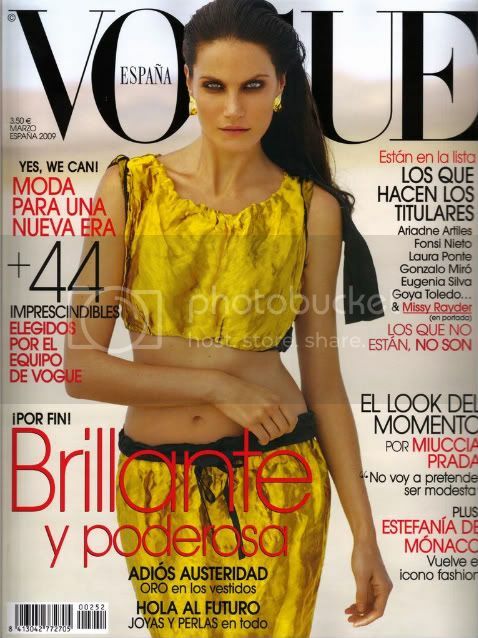 The Colecciones cover: couldn't they have used a better runway shot? I love it ! Fierce expression, mysterious make-up and great colourful dress...Wow! I do think that she's great here... her expression is just wow!! ... spain really like missy!! But the prada clothes( i think it is prada??) ... not my taste at all..
Nobody mess with the rayders eyes! Like her sister, she's really working the stare! A little sick of the prada dress (as always every season) though. Oh no... I don't want to see her belly Maybe if it was covered it would look good. Any Edito of Marina Perez? Cant wait for the Chanel edit! I think the cover is amazing, can you posted a Picture of the unknow models?